Since the beginning of 2015, investors have deployed billions of dollars into crypto tokens that power open-source networks. These include both tokens that power decentralized application and smart-contract platforms (eg EOS, Ethereum) and ones that power protocols built on top of these blockchains (eg 0x, Maker). These tokens are designed to align incentives among network participants and (in theory) should increase in value as network usage grows. When a token increases in value, it draws the attention of developers and speculators. These developers then purchase some tokens and become stakeholders in the network. Now that these developers have a vested interest in the network’s success, they’ll build applications on top of it. Some of these applications become successful and bring in new users, further increasing the value of the tokens and drawing in more investors. While this model relies on a number of untested assumptions, I find the expectations about developer behavior to be the most interesting. Despite the billions of dollars riding on developer adoption of these protocols, I’ve seen little analysis as to whether the incentives described above are actually motivating developers. There are large unanswered questions around whether this engagement model is working, how teams are attempting to drive this adoption, and how to quantify developer adoption. In this post I attempt to make a (small) contribution to this debate by analyzing why developer adoption matters for crypto protocols. I then look at what teams in the space have done to attract developers and assess what approaches have been successful. 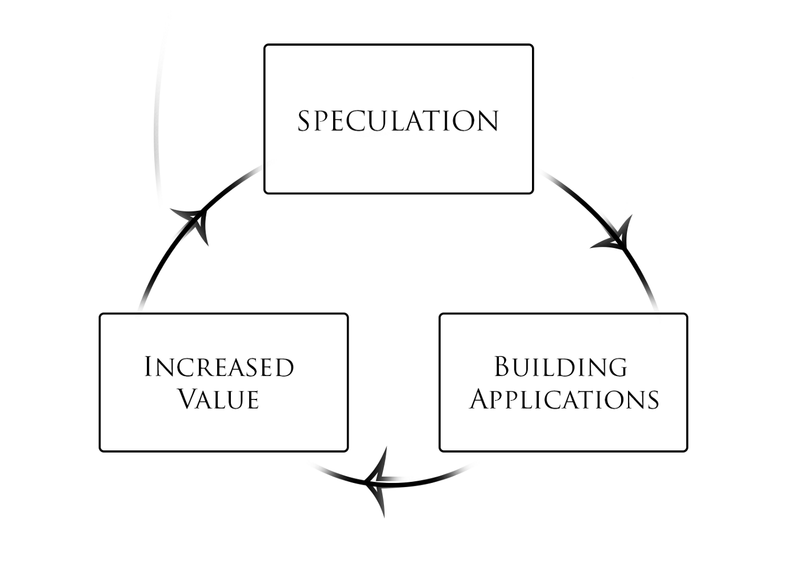 I conclude by suggesting a few ways to quantify developer adoption. For the past few decades, most companies have had a fairly simple business model — produce software and charge for accessing it. In the early days of the internet, company’s generally charged for a ‘license’ or physical software disk (eg $50 for a copy of Microsoft word). In the past decade, Software as a Service (SaaS) — whereby companies charge a recurring fee for access to cloud-based software — has become the more dominant pricing model. More recently, companies like MongoDB have built large business on top of open-source software by charging for additional tools. While there are nuances between token models, almost all rest on the idea that applications (or products or services) need to be built on top of their protocol in order to drive usage. Over the past few years teams in the space have invested significant resources in attracting developers. In 2018, Block One, the team behind EOS, spent millions of dollars hosting hackathons across the globe. Ethereum has adopted a more community-driven approach, but this still relegates Vitalik Buterin, its founder and public face, to an unenviable life spent on airplanes traveling the world to evangelize Ethereum (despite a personal net worth of $100M+). Some of the most common strategies adopted by blockchain teams include hackathons, grant programs, and ecosystem funds. While hackathons predate the bitcoin white paper by at least decade, a number of teams in the space have leaned heavily on them to attract developers. Ethereum, which has the largest developer community in crypto, has had the most success with hackathons. The most prominent organizer of Ethereum hackathons is ETH Global, which is independent from (although funded by) the Ethereum Foundation. Since organizing ETHWaterloo in October 2017, they’ve run more than half a dozen additional hackathons that have attracted over 4000 developers. While the data is far from definitive, early data points to these hackathons being fairly effective. It’s hard to argue with the numbers — in 2018 alone, ETHGlobal introduced 1000’s of hackers from 60+ countries into the Ethereum ecosystem. They will almost definitely beat their 2018 numbers this year, as ETH Denver hosted over 1000 developers in February. The effectiveness of hackathons in getting people to remain in an ecosystem is much less certain. Many teams that sponsor prominent hackathons in the space have told me that most projects are never touched again after the hackathon ends. This isn’t surprising — many developers that come to a weekend hackathon like ETHDenver have to go back to their full-time jobs come Monday morning. On the other hand, there are examples of impactful companies emerging from weekend hackathons. Felix Feng built the earliest version of Set Protocol at ETH Waterloo in October 2017 and a few months later he raised $2M from a phenomenal group of investors (I interviewed Felix about that experience). Furthermore, it’s likely that these hackathons have positive impacts for Ethereum later down the line — for example, a developer deciding to enter the space full-time a few months after attending a hackathon. Ethereum is not the only smart contract platform to leverage hackathons to drive developer adoption. Block.one, the team behind EOS, used its war-chest to put up over $1.5M in bounties for a global set of hackathons last year. Block.one’s spending dwarfs anything in the Ethereum ecosystem — their London hackathon had a whopping $100K prize, a huge amount of money for a 48 hour event. It’s tough to determine the impact of Block.one’s hackathon push given its recency, but well-versed people in the space have told me they’ve been impressed with the results. The EOS London Hackathon alone had almost 500 attendees, which feels impressive for a blockchain that is less than two years old. I haven’t attended any EOS events and so it’s tough to compare them, but the weekend I spent at ETH Denver earlier this year left me really impressed with the Etheruem community. Despite a relatively small amount of prize money at stake, 1000+ developers had flown in from all over the world. There wasn’t really any talk about prize money or token prices — instead, people seemed genuinely excited to learn about Ethereum and meet others from the community. While some of the Ethereum community efforts seem cringeworthy from afar, I really believe that the community they’ve built is hard replicate. In the context of crypto, I define grant programs as programs distributing non-dilutive capital to teams building on top of or for a specific protocol. These programs often also include non-financial assistance like technical help. Teams offering non-dilutive funding to people building open-source software is not something new to smart-contract platforms (see Stripe’s grant program from 2014). However, the sheer amount of capital available in the context of crypto is pretty unique. The Ethereum Foundation launched its DEVGrants program in early 2015, giving out small grants of $1K to $10K per project. The stakes had clearly changed by 2018 when the Ethereum Foundation re-launched their grant program, with grants ranging from $10K to $1.5M. A number of protocols within the Ethereum ecosystem also have grant programs for teams utilizing their software. In December, 0x announced a $1M+ per year Ecosystem Acceleration Program and Maker has been giving out $25K grants since February 2018 as part of its Stable Fund. Most layer-one chains have similar grant programs including Zilliqa’s $5M grant program (June 2018), Protocol Labs’ $5M research grant program (April 2018), and Stellar’s Partnership Grant Program (Nov 2017). While all of these grant programs focus on ecosystem growth, there are differences in their specific goals. Zilliqa for example, focuses on “the development of new applications on their open source technology platform.” Protocol Labs (Filecoin), on the other hand, has focused their grant program on core development challenges like their consensus algorithm. Are these programs effective? It’s really hard to tell. Very few of these programs are more than two years old, which is a short timeline to evaluate the success of early companies. Moreover, very few of these grant programs have released much data publicly. There are some anecdotal success stories. For example, the Ethereum Foundation gave Uniswap a $100K grant in August 2018 and Uniswap has been on a tear ever since, currently holding $7M in its contracts. However, tracking the progress of projects building things like core infrastructure is more challenging. There are certainly downsides when it comes to grants. It makes the team reliant on a non-profit foundation for funding and can create uncertainty about what happens when that funding runs out. There is a fairly defined process for companies on the venture route — start raising a Series A 12 months after raising a seed round and go from there. The path for future funding from ecosystem grants is much less certain given that these foundations are often holding their treasures in highly volatile assets. There’s also much less accountability for teams. Venture may not be the most transparent industry, but funds are accountable to their LP’s and I believe that that market operates reasonably efficiently. Venture capitalists are also often fairly transparent with teams about what metrics they want to see. It’s not clear how most grant programs are making decisions about future funding and who they have to answer to. I also worry about selection bias. There are certain cases — like core infrastructure for Ethereum 2.0 that is tough to monetize — in which grant funding makes sense. There is also a reasonable case to be made that grant funding can be a bridge from project inception to venture funding. That said, I’m not convinced that teams that could raise money from top investors are generally the ones applying for grant programs. While venture funding is dilutive, it gives teams more certainty and the signaling is likely helpful with things like hiring. I broadly define ‘ecosystem funds’ as managed funds that invest dilutive capital with the goal of growing a specific ecosystem or protocol. This is an evolution of corporate venture capital, where corporations invest into early stage companies for both strategic and financial reasons. Funds investing into crypto solely to make a return on their investment are not ecosystem funds. Consensys was the earliest ecosystem fund in crypto. Joe Lubin, a co-founder of Ethereum, launched Consensys in October 2014 in order to expand the Ethereum ecosystem by building core infrastructure and applications on top of it. Lubin, whose net worth at peak ETH prices was estimated to be between $1 and $5B, has funded Consensys almost entirely out of pocket, likely to the tune of $100M per year. It’s important to note that these funds did not come from the Ethereum pre-sale or Ethereum Foundation, but rather just from Lubin’s personal holdings. Consensys has had some real success and undoubtedly helped grow the Ethereum ecosystem. Truffle, a development framework for Ethereum, has been downloaded hundreds of thousands of times. MetaMask, which is the world’s most popular Ethereum wallet, has over 1.3 million downloads. However, Consensys may have spread itself too thin and has recently had to lay off a large chunk of its staff and shutter some portfolio companies. More recently, protocols have started deploying money directly from their treasuries (generally raised via ICO’s) into managed funds. EOS, which raised $4B in its ICO, has pledged $1B of that treasury to invest into funds that are investing in companies building on top of EOS. The largest fund announced so far is a $325M “EOS.IO Ecosystem Fund” that is managed by Mike Novogratz’s Galaxy Digital. EOS has also committed to a number of other funds including a $100M Europe focused fund and a $200M Asia focused fund. There is very little data available to assess how these ecosystem funds are doing. However, I worry that funds only investing into a specific ecosystem face a risk of selection bias. Given how much protocol-agnostic capital there is in the ecosystem, it will likely be very competitive for ecosystem funds to get into the best deals. If you’re a team of developers and have a term sheet from a16z or Paradigm, I struggle to see a strategic fund like EOS VC adding so much value that you’d rather take money from them than from a protocol agnostic fund (that presumably comes with fewer strings attached). Venture capital generally follows power law returns. First, returns tend to be concentrated at the best funds — in other words, the most impactful companies tend to be highly concentrated in the portfolios of the top VC firms. Second, this small group of companies tends to generate a large majority of returns for most venture capital funds. If technology companies follow power law returns when it comes to impact, this means that a small number of companies will win a large amount of market share, create a large amount innovation — and hire a large percent of developers. If you believe that the best funds — let’s say Paradigm and Polychain for argument’s sake — are going to fund the best companies, then ecosystem funds could end up underwhelming in the grand scheme of things. On the other hand, there are compelling reasons as to why these funds may end up being consequential. Protocol dependence is a huge risk to companies building applications — anyone building a relayer on top of Augur or 0x is dependent on those protocols to continue shipping. If ecosystem funds can give portfolio companies access to their protocol’s team — and this is almost definitely part of their pitch — then that’s a huge selling point to entrepreneurs. Anecdotally, they may already be working. I’ve spoken to multiple teams that are deciding to build on EOS because that’s where the money is (among other reasons). These funds have also backed some great teams — Consensys has invested in impressive technical teams like StarkWare and AZTEC, while Galaxy EOS has backed incredibly experienced entrepreneurs with investments in Good Money and Mythical Games (disclosure: I’m an investor in Good Money). I had originally planned to start this section by lamenting how little analysis I’ve seen on tracking developer activity in the space, but then Electric Capital published their Dev Report in March— and it’s really, really good. Maria Shen has analyzed a tremendous amount of data and paints the clearest picture I’ve seen to date of developer engagement across protocols. I’ve included some ideas on quantifying developer engagement below. Each method has tradeoffs — for example, Github activity doesn’t capture any data about DAU’s. My guess is that the most thorough approach is to combine some of these approaches. Developer engagement remains one of the most important but under-explored areas in the space. Indeed, much of the writing about smart contract platforms has focused on technical and/or academic topics like consensus mechanisms and on-chain governance. These topics are certainly important — but they presuppose a healthy ecosystem of applications using these platforms. If the developers aren’t there, then quite literally nothing else matters. If you’re interested in chatting more about developer engagement, reach out on Telegram. Thanks to Andy Bromberg, Ash Egan, Clay Robbins, and Spencer Noon for feedback on this piece. These are my personal views and not those of CoinList. This is not legal or investment advice. Business Ops @CoinList. Past lives @AngelList @Handy.📍San Francisco. 🏠 New York.